I suspect that it is the failure of evangelical people, particularly during the last sixty to seventy years, to take seriously the biblical teaching concerning the nature of the Church, that accounts for most of the problems that we are confronting at the present time. For some reason or another, our immediate fathers and grandfathers felt that it was sufficient to form movements and they did not think in terms of the Church, with the result that evangelical witness is diluted among the great denominations and evangelical Christian people only meet together in movements instead of in Churches. So from that standpoint this is a highly important subject. If we have a deep concern about the evangelical message and its vital importance in the world today, then we are compelled to consider the doctrine of the Church. *Lloyd-Jones, D. M. (1998). The church and the last things (3). Wheaton, Ill.: Crossway Books. 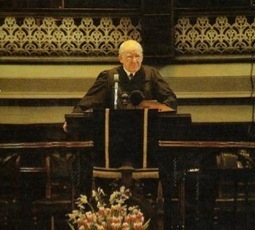 This entry was posted in Church, Martyn Lloyd-Jones. Bookmark the permalink.